Part of Corporate Services‒Knowledge and Information Services, the Archives was established in 1973 as the official repository for the Bank of Canada’s historical records. The Archives preserves the corporate memory of the Bank of Canada by acquiring, preserving and making accessible records of continuing value that best describe the Bank's origins, policies, interests, evolution, functions and activities. Records in the Archives, to which certain access restrictions apply, include handwritten notes, typewritten correspondence, memoranda and news clippings; over 25,000 photographs, scrapbooks, posters (Victory Loans and Canada Savings Bonds), and architectural drawings; films; and audio and video cassettes. The photographic collection of the Bank of Canada Archives contains official and amateur photographs in black and white and colour, illustrating the architecture, organization, artwork, functions and interests of the Bank of Canada. The collection contains photographs of the Governors, the Board of Directors, Bank personnel, special events, buildings and premises. 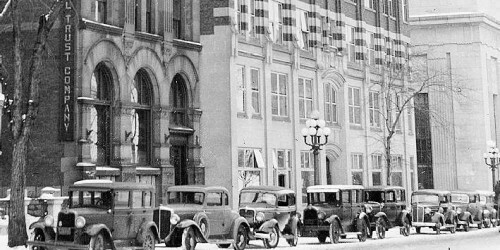 Photographs of special events include the laying of the cornerstone of the centre building in 1937 by Prime Minister Mackenzie King and Governor Towers, employee recognition dinners, and anniversary celebrations. The Archives has a mandate to preserve and make accessible the photographs used in Bank Notes, an employee newsletter. The photographs begin in 1974 and depict activities such as Christmas receptions, retirement receptions and sporting events. As well, the Archives has a small collection of Bank of Canada Staff Association photographs dating back to the early 1950s. An inventory list is available. Graham Ford Towers was born in Montréal, Quebec, on 29 September 1897. He was appointed the first Governor of the Bank of Canada effective 8 September 1934. Mr. Towers was also Chairman, Foreign Exchange Control Board, 1939-1951; Chairman, National War Finance Committee, 1943‒1945; President, Industrial Development Bank; and Alternate Executive Director for Canada of the International Bank for Reconstruction and Development. He retired on 31 December 1954. Mr. Towers died on 4 December 1975. The fonds consists of correspondence, memoranda, speeches, photographs, a diary, scrapbooks and memorabilia. Records include information relating to gold, post-war currency plans, war financing and international financing. James Elliot Coyne was born in Winnipeg, Manitoba, on 17 July 1910. He was appointed Governor of the Bank of Canada effective 1 January 1955. He was the President of the Industrial Development Bank. During his career, he held several important posts, including Secretary, Foreign Exchange Control Board, 1939-1941; Financial Attaché, Canadian Embassy Washington, 1941; Assistant to the Chairman and then Chairman, Wartime Prices and Trade Board, 1941-1942. He served in the Royal Canadian Air Force from 1942 to 1944. Mr. Coyne resigned as Governor and retired from the Bank in 1961. The Coyne Collection contains several series of minutes, correspondence, speeches, memoranda and newspaper clippings. UN Assembly and the Economic and Social Council 1945-1946; Member of the original Board of the International Monetary Fund, serving in this capacity from 1946 to 1961; and Executive Director of the International Bank for Reconstruction and Development, 1950-1962. He was appointed Deputy Governor of the Bank in 1955 and Governor in 1961. Mr. Rasminsky resigned on 1 February 1973. He was Chairman of the Board of the International Development Research Centre from 1973 to 1977. Mr. Rasminsky died on 15 September 1998. The fonds consists of correspondence, memoranda, reports, pamphlets, speeches, photographs and newspaper clippings on international economic affairs and central banking. Foreign exchange control was imposed in Canada at the outbreak of World War II to maintain exchange stability and to conserve exchange resources. Foreign exchange control was abolished on 14 December 1951, and the board was disbanded. The fonds includes annual reports, minutes of meetings, correspondence, memoranda, newspaper clippings and speeches. The Industrial Development Bank was established by an Act of Parliament in 1944 to "promote the economic welfare of Canada by increasing the effectiveness of monetary action through assuring the availability of credit to industrial enterprises." In 1974, the Industrial Development Bank became the Federal Business Development Bank (now the Business Development Bank) at which time, it ceased to be a subsidiary of the Bank of Canada. The fonds consists of Board of Directors' agendas, annual reports, bylaws, correspondence and memoranda. The National War Finance Committee was established by the Minister of Finance to organize, advertise and conduct all public loan campaigns used to finance Canada's war effort during World War II. Graham Towers, the Bank of Canada's first Governor, was Chair of the National War Finance Committee. The fonds consists of correspondence, minutes of meetings, posters, scrapbooks, films and sound recordings. In March 1935, the Bank of Canada opened its doors as a privately owned institution, with shares sold to the public.